The 18k/platinum version uses an 18K yellow gold channel sleeve with a center insert of platinum for a bi-colored appearance only on the outside of the band. This is truly a high class designer wedding band to be set apart from the rest. 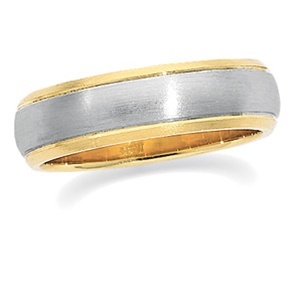 This ring comes in a width of 6mm and is domed along the top. It is also a comfort fit band.